The purpose of this article is to provide an overview regarding the impact of the FASB Accounting Standards Codification – Topic 606, Revenue from Contracts with Customers (ASC 606) on Not For Profit entities. 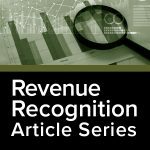 The new revenue recognition framework is effective for non-public entities, including not for profit entities (NFPs), for periods beginning after December 15, 2018, and interim periods within annual periods beginning after December 15, 2019. Early application is permitted for non-public entities one year prior to the aforementioned effective periods. Previous guidance will remain in force related to accounting for contributions; however, all revenue generated from exchange transactions will be subject to the new standard. For NFP’s, this revenue is generally derived from membership fees, sales of products and/or services, certain rights, sponsorships, and special events. Fees from membership dues may result in obligations by a NFP to provide various benefits at varying times which will require a specific judgment and estimation under the new framework. When membership dues carry traits of both contributions and exchange components, they should be bifurcated as required by ASC 606-10-15-4. Previous guidance remains in effect for differentiating contributions from exchange transactions (ASC 958-605-55-8) and contributions from exchange portions of membership dues (ASC 958-605-55-12). A contract with a customer may create legal rights and obligations whether or not the contract is in writing. The rights and obligations under the contract may in turn give rise to contract assets and contract liabilities. An NFP charges $100 annually for membership dues. Invoices are initiated and mailed on January 1. As a result of purchasing a membership, members receive one admission to an annual conference which includes a meal and a quarterly magazine. In addition, exclusive member benefits are provided continuously over the course of the year. For purposes of this example, assume that all transactions take place within one reporting period (fiscal year). The NFP has identified two performance obligations (1) admission to an annual conference which includes a meal, and (2) four quarterly magazines. Since admission to the annual conference and the meal received at the conference are coupled together and cannot be separately attained, they are considered one single performance obligation. The NFP has determined the stand-alone selling price (ASC 606-10-05-4d) of each performance obligation which is defined as the price at which an entity would sell a promised good or service separately to a customer (ASC 606-10-32-32), based on observable evidence. As a result of the analysis in the previous step, the value of the admission to the annual conference and corresponding meal is $24, the value of the quarterly magazine is $40 ($10 per magazine, per quarter), and management estimated the value of the other member-only benefits provided throughout the year to be $36. The first performance obligation, admission to the annual conference and corresponding meal, is satisfied once the annual conference has occurred. The second performance obligation, delivery of the quarterly magazine, is satisfied over time and based on when the member receives the magazine. This example illustrates the bifurcation of revenue required by the new revenue recognition framework. Readers should note that the new framework uses the term “contract liability”, which is currently referred to as “deferred revenue” or “unearned revenue”. A key takeaway from this example is that revenue is recorded when the performance obligation is satisfied. Under the existing generally accepted accounting principles, dues revenue would typically be recognized on a monthly basis calculated as $100 / 12 months = $8.33. This example assumes $36 of the annual dues as an exchange transaction. Membership organizations need to determine the contribution and exchange portions of their membership dues. If an NFP has a membership cycle, tuition year, subscription period, etc. that coincide with the NFP’s fiscal year, the new revenue standard may have little to no affect on the amounts reported in the year end financial statements. However, the new standard will require enhanced and additional note disclosures. If you have questions on how the new revenue recognition will affect your organization, Selden Fox can help. For additional information please call us at 630.954.1400, or click here to contact us. We look forward to serving you soon.